Coral diseases have been increasingly reported over the past few decades and are a major contributor to coral decline worldwide. The Caribbean, in particular, has been noted as a hotspot for coral disease, and the aptly named white syndromes have caused the decline of the dominant reef building corals throughout their range. White band disease (WBD) has been implicated in the dramatic loss of Acropora cervicornis and Acropora palmatasince the 1970s, resulting in both species being listed as critically endangered on the International Union for Conservation of Nature Red list. The causal agent of WBD remains unknown, although recent studies based on challenge experiments with filtrate from infected hosts concluded that the disease is probably caused by bacteria. Here, we report an experiment using four different antibiotic treatments, targeting different members of the disease-associated microbial community. Two antibiotics, ampicillin and paromomycin, arrested the disease completely, and by comparing with community shifts brought about by treatments that did not arrest the disease, we have identified the likely candidate causal agent or agents of WBD. Our interpretation of the experimental treatments is that one or a combination of up to three specific bacterial types, detected consistently in diseased corals but not detectable in healthy corals, are likely causal agents of WBD. In addition, a histophagous ciliate (Philaster lucinda) identical to that found consistently in association with white syndrome in Indo-Pacific acroporas was also consistently detected in all WBD samples and absent in healthy coral. Treatment with metronidazole reduced it to below detection limits, but did not arrest the disease. However, the microscopic disease signs changed, suggesting a secondary role in disease causation for this ciliate. In future studies to identify a causal agent of WBD via tests of Henle–Koch's postulates, it will be vital to experimentally control for populations of the other potential pathogens identified in this study. Echinopora lamellosaThis study investigates potential causes of a novel blister-like syndrome in the plating coralEchinopora lamellosa. Visual inspections of this novel coral syndrome showed no obvious signs of macroparasites and the blisters themselves manifested as fluid-filled sacs on the surface of the coral, which rose from the coenosarc between the coral polyps. Histological analysis of the blisters showed that there was no associated necrosis with the epidermal or gastrodermal tissues. The only difference between blistered areas and apparently healthy tissues was the presence of proliferated growth (possible mucosal cell hyperplasia) directly at the blister interface (area between where the edge of the blister joined apparently healthy tissue). No bacterial aggregates were identified in any histological samples, nor any sign of tissue necrosis identified. We conclude, that the blister formations are not apparently caused by a specific microbial infection, but instead may be the result of irritation following growth anomalies of the epidermis. However, future work should be conducted to search for other potential casual agents, including viruses. Aquacultured corals are typically reared in dense in situ (mariculture) or ex situ (in aquaria) culture facilities. This high density rearing method makes these corals particularly vulnerable to specific diseases since virulence and communicability of pathogens have been shown to increase with host density. As such, entire production lines may be threatened. Maricultured corals are particularly at risk as the diversity of both diseases and of affected coral species in the marine environment is on the rise. Coral diseases are now a major driver of coral mortality on all reef systems from the Indo-Pacific through to the Caribbean and not only affect species in situ, but can be inadvertently transported into the culture systems. The avoidance of disease outbreaks in culture systems is of upmost importance and the mitigation of diseases in these systems is vital in the maintenance of healthy cultures. Although the study of naturally occurring coral diseases has become a popular and relatively well-studied topic over the last few decades, the effects of these diseases on coral husbandry and aquaculture are still virtually unknown. Aquaculture of corals is a developing industry, both for stocking the ornamental industry and for restoration purposes. This overview outlines what is known about coral diseases in aquaculture; what implications these diseases have on this activity; what may be the causes of the disease outbreaks in these systems, as well as what methods are available for maintenance of healthy stocks and for mitigation once a disease has been observed. Coral diseases are a major factor in the decline of coral reefs worldwide, and a large proportion of studies focusing on disease causation use aquaria to control variables that affect disease occurrence and development. Public aquaria can therefore provide an invaluable resource to study the factors contributing to health and disease. In November 2010 the corals within the main display tank at the Horniman Museum and Gardens, London, UK, underwent a severe stress event due to reduced water quality, which resulted in death of a large number of coral colonies. Three separate colonies of two species of reef coral, Seritopora hystrix and Montipora capricornis showing signs of stress and acute tissue loss were removed from the display tank and placed in a research tank with improved water quality. Both coral species showed a significant difference in 16S rRNA gene bacterial diversity be-tween healthy and stressed states (S. hystrix; ANOSIM, R=0.44, p=0.02 and M. capricornis; ANOSIM, R=0.33, p=0.01), and between the stressed state and the recovering corals. After four months the bacterial communities had returned to a similar state to that seen in healthy corals of the same spe-cies. The bacterial communities associated with the two coral species were distinct, despite them being reared under identical environmental conditions. Despite the environmental perturbation being identical different visual signs were seen in each species and distinctly different bacterial communities associated with the stressed state occurred within them. Recovery of the visually healthy state was associated with a return of the bacterial community, within two months, to the pre-disturbance state. These observations suggest that coral-associated microbial communities are remarkably resilient and return to a very similar stable state following disturbance. Dr Caroline Palmer created this site to bring together the current and emerging information on coral immunity. Her aims are to highlight key developments in the field and to discuss the gaps in research and the potential broader impacts. She posts synopses of published scientific papers that relate to coral immunology. The polyclad flatworm, Amakusaplana acroporae or AEFW, is a voracious predator of Indo-Pacific Acropora corals in captivity, and its inadvertent introduction into aquaria has lead to the death of entire coral colonies. While this flatworm has been a pest to the coral aquaculture community for over a decade, it has only been found in aquaria and has never been described from the wild. Using morphological, histological and molecular techniques we determine that a polyclad found on Acropora valida from Lizard Island, Australia is the AEFW. The presence of Symbiodinium and spirocysts in the gut indicates that it is a corallivore in the wild. Conservative estimates of abundance show that the AEFW occurred on 7 of the 10 coral colonies collected, with an average of 2.6 ± 0.65 (mean ± SE) animals per colony. This represents the first report of the AEFW in the wild, and sets the stage for future studies to identify viable biological controls for more successful rearing of Acropora colonies in aquaria, and for our understanding of what impacts this animal has on the reef. 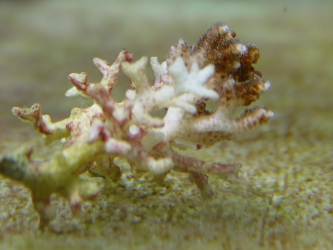 Many reef coral diseases have been described affecting corals in the wild, several of which have been associated with causal agents based on experimental inoculation and testing of Koch’s postulates. In the aquarium industry, many coral diseases and pathologies are known from the grey literature but as yet these have not been systematically described and the relationship to known diseases in the wild is difficult to determine. There is therefore scope to aid the maintenance and husbandry of corals in aquaria by informing the field of the scientifically described wild diseases, if these can be reliably related. Conversely, since the main driver to identifying coral diseases in aquaria is to select an effective treatment, the lessons learnt by aquarists on which treatments work with particular syndromes provides invaluable evidence for determining the causal agents. Such treatments are not commonly sought by scientists working in the natural environment due the cost and potential environmental impacts of the treatments. Here we review both wild and aquarium diseases and attempt to relate the two. Many important aquarium diseases could not be reconciled to those in the wild. In one case, however, namely that of the ciliate Helicostoma sp. as a causal agent of brown jelly syndrome in aquarium corals, there may be similarities with pathogenic agents of the wild coral diseases, such as white syndrome and brown band syndrome. We propose that Helicostoma is actually a misnomer, but improved understanding of this pathogen and others could benefit both fields. Improved practices in aquarium maintenance and husbandry would also benefit natural environments by reducing the scale of wild harvest and improving the potential for coral culture, both for the aquarium industry and for rehabilitation programmes. 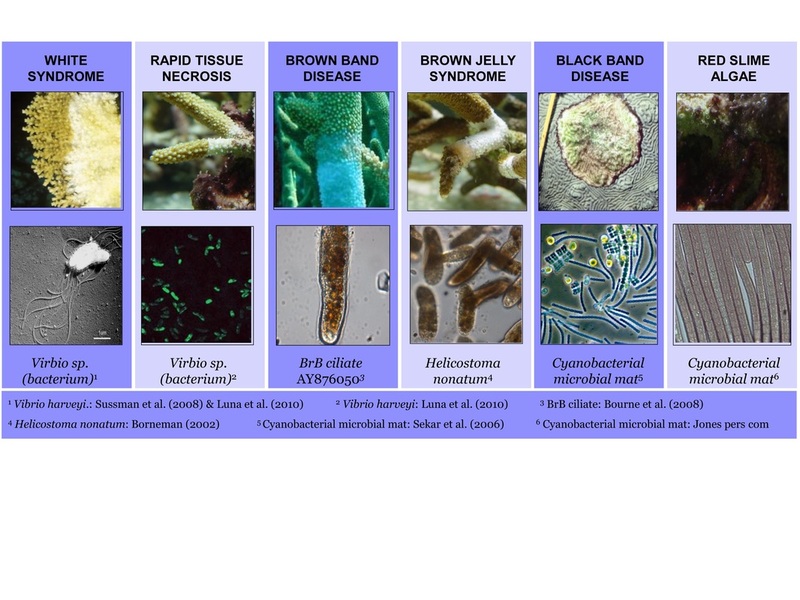 This figure illustrates the diseases commonly found in aquarium and the proposed casual agents linked to them to date.